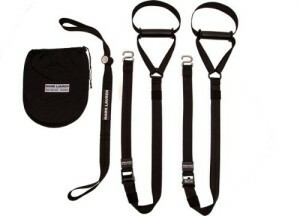 One of the hottest new pieces of workout equipment to consider for your workout program is suspension training straps. Not only will these make for the most enjoyable workout you’ve likely ever completed, but in addition to that, they’re also ideal for boosting your functional strength and really enhancing your overall strength and stability. Because your core muscles will be contracting extremely intensely with each move you make while using the suspension straps, you can rest assured you will be gaining total body strength everywhere. Before reading more about suspension trainers, feel free to watch the video below which showcases the benefits of suspension trainers (in this case the TRX). Let’s take a closer look at what suspension straps are all about so that you can decide if they are something you want to invest in adding to your functional strength workout routine. Why Use Suspension Training Straps? Suspension training straps are an excellent way to take a regular workout and really supercharge it so that you work more total muscle fibers in each move you do. Because of the fact the body will be so unbalanced as you use your suspension training straps, this means you require far more core muscle activation and will work muscle fibers deep within the muscle belly. This translates to greater strength gains for you. Furthermore, using suspension training straps will increase the total challenge of the workout, without increasing the amount of weight your joints are bearing. For those who are at a high risk of joint pain or problems, this comes in incredibly helpful. 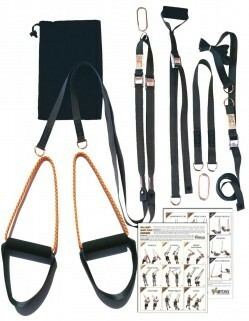 Suspension training straps also allow for a wide variety of different exercises as well including push-ups, pull-ups, tricep dips, jackknife prone crunches, and many more. The options are really endless when it comes to using suspension training straps. You will need a large (ish) area to utilize the straps to ensure no furniture gets in your way, especially when doing the window wiper type abdominal exercises. When purchasing suspension training straps, you should be looking for ones that have a very durable strap, especially if you are a heavier individual. Check to see if they list a max load to ensure it’s something that will support your own body weight. You’ll also want to seek out ones that have a comfortable handle grip so you’re less prone to blistering and that feel roomy enough in your hands. If you have larger hands, make sure you can easily wiggle around slightly in the strap. Finally, look for suspension training straps with a longer length to the strap so that you can move through various movements with ease. Description: The TRX has a great reputation and it is the model of suspension trainer that “swept” across the globe and made suspension training “mainstream”. It is a high quality item and it is very easy to use and it is my “go to” suspension trainer. That being said, I do have one gripe…the inability to space out the straps for certain exercises like the dip. I have made a spacer out of PVC pipe so I no longer have this issue but there is no way to do this on the standard product. It is also pricey for what it is. Description: Mark Lauren is a great trainer who started out as an elite Special Operations soldier (as did Randy Hetrick who designed the TRX – Navy Seals) before becoming a qualified Physical Trainer. He then became the lead PT instructor for Special Operations and SO trainees. His You Are Your Own Gym training program is brilliant and it is very popular. Mark has a whole series of quality products, and his suspension trainer is no exception. It is a simple and effective suspension trainer that won’t break the bank. Description: The Jungle Gym XT is another very popular brand of suspension trainer. I love the fact that this design allows for you to spread the straps apart for dips and certain other exercises. It is made from quality components and is well priced. Description: The WOSS trainer is another simple but effective trainer. It is made from quality components and is also well priced. If you want to supplement your Calisthenics training (or weights training if you are into that sort of thing), a suspension trainer is ideal. Just remember…they aren’t a necessity. You can get a great workout just using your own bodyweight. As usual, price is always a factor. However, I’m a firm believer in the saying “you get what you pay for” which is why I personally use and recommend the TRX. If price is an issue, the Marl Lauren, XT Jungle Pro and WOSS systems are cheaper options. So…if you want to see all the possibilities this piece of equipment holds, get yourself a set of suspension training straps. For optimal balance, strength and stability training, they’re hard to beat. Keep up to date with whats happening at Strength & Stability by signing up to our newsletter below. To return to the Strength and Stability homepage where you can read about the benefits of Calisthenics, click here. I’m confused. You rate the TRX 4/5 and all other options 4.5/5, but in your final synopsis you recommend TRX? Good question…but basically, the TRX ONLY scores lower than the other trainers because of cost. It is the most expensive! However, the build quality is very good. I’ve had mine for…I don’t know, 7 years or so and it’s still going strong! As I mentioned in the article, I use the TRX and can HONESTLY recommend it because it IS a high quality piece of kit and WILL last and IMHO you often get what you pay for! So…if you can afford it…TRX or LifetimeUSA Jungle Gym XT. If you can’t, a lower cost trainer will work BUT I can’t guarantee how long for. IF my TRX ever dies (and goes to Suspension Trainer heaven) and I need a new trainer, I would seriously consider the LifetimeUSA trainer because the quality (like the TRX) is very good but it won’t break the bank!